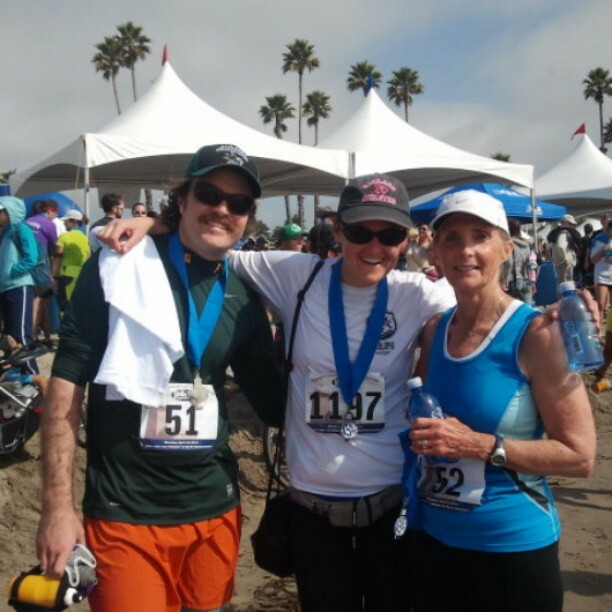 Ryan, Shirlee and I ran a half marathon in Santa Cruz this morning. It was Ryan's first half, my fourth, and Shirlee's seventh. This is perhaps my favorite course; it runs along West Cliff, around Natural Bridges State Park, and circles the bluffs out at Wilder State Park. Shirlee and I ran it last year and I convinced Ryan to train with me this winter. A few weeks before we started dating, Ryan told me about a 10k in Golden Gate Park. He sent me link and mentioned that he'd be running it with his family. My dad and I ran it together, though I kept my eye out for Ryan and Richie. I kept pace with my dad until the final mile, at which point I broke free and tried furiously to catch Ryan, thinking what a badass I'd be if I beat him in that final push. Needless to say, I did not beat him, though I very nearly caught up. We said hi to each other and then walked our separate ways to stretch. Two months later he donned his now-famous Christmas moose sweater and surprised me with a kiss on his back porch. The two years I was in grad school, I ran three half marathons with Shirlee, and at each of them, our families were there to cheer us on, Ryan always waiting on that final corner to shout encouragement. Last spring, he trained for a 10k and placed well. This winter, while juggling five classes and coaching badminton, he ran with me every Saturday morning. Within a few weeks he had me beat. I've come to realize that the activities I love most require the fiercest form of persistence. Writing, running, camping, traveling--in some cases, even reading demands a sustained attention that these days is kind of rare. These are all activities that I enjoy doing alone--and love doing with my favorite people. I've noticed, too, that it is much easier to be persistent when can feel support the whole way through---on the sidelines or even a mile or two down the road.